Preheat the oven to 350 degrees F. Put a cast iron or other ovenproof skillet large enough to hold the chicken in a single layer, or a small roasting pan, over medium heat and get it good and hot. Drizzle the pan with a 3-count of oil. Add the prosciutto and rosemary and cook, stirring, until the prosciutto is crisp and lightly browned, 3 to 4 minutes. Push to one side of the pan. Season the chicken on both sides with a generous amount of salt and pepper and add it to the pan, skin side down, in a single layer. Cook for about 5 minutes until the skin begins to set and crisp. Turn and cook 3 more minutes. Turn the chicken again, stick the pan in the oven and roast until the chicken is tender and cooked through, about 30 more minutes. Take the pan out of the oven. 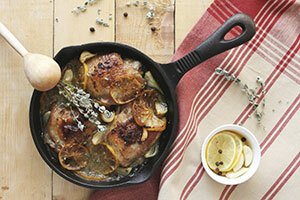 Remove the chicken and prosciutto from the pan and arrange on a platter to keep warm while you prepare the pan sauce. Pour out all but about 1 tablespoon of the rendered chicken fat and return the pan to the stove top. Stir in the stock and lemon juice. Cook over medium heat, scraping up the flavors stuck to the bottom of the pan with a wooden spoon, until reduced to a syrup, 3 to 5 minutes. Season with salt and pepper. Drizzle the pan sauce over the chicken and serve immediately. Serves 4. Recipe compliments of Tyler Florence, Food Network. Clean and bright, with an outstanding deep ruby-red color. The nose is intense, with notable fruit aromas of strawberry, black cherry, and blueberry accompanied by spicy aromas that recall bay leaf, white pepper, and an interesting hint of tobacco. The voluminous palate has smooth, elegant tannins and a tremendously long finish. This entry was posted in Recipes and tagged cabernet franc, camilo viani, chilcas, chile wine, chilean wine, food pairing, maule valley, pan roasted chicken, prosciutto, recipe, roasting pan, single vineyard, wine, wine pairing. Bookmark the permalink.